February has just wrapped up and it’s time to publish my monthly traffic numbers, experiment results and plans for the future. Despite the lack of content, I have continued my conversion experiments – which are yielding some pretty interesting results in terms of email signups. Looking at the top referrers, there are o few really interesting changes. The first is Google Plus, which has send double the traffic compared to January – mainly because I’m trying to be more active on this network. The second unexpected traffic source (which I noticed right now, while I was writing this update) is programcreek.com – specifically their Top 100 Java blogs list. My blog has been proposed in the comments and is now on this list – thanks Vlad. 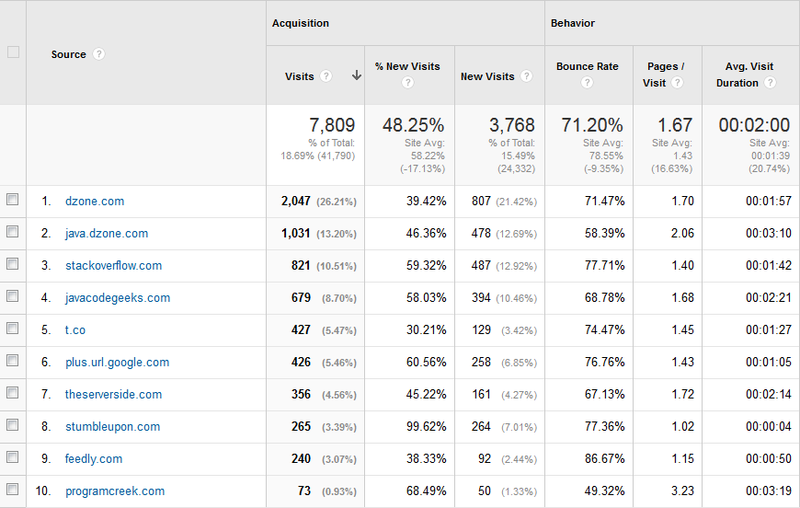 You may have noticed a traffic source that has never been in my top 10 before – StumbleUpon. This is not due to that community suddenly stumbling upon my blog for the first time – it is just the result of a paid traffic experiment I ran in February. I will probably write about that at some point, but I don’t yet have enough data for a full article. If you’ve been reading these monthly reports, you know that growing email optins has been my focus for the last few months. February is no different – I ran two experiments: the first, involved showing a Call to Action only to new users – I published the results here. The second experiment is still ongoing and to early to call, but the results are quite exciting – I’ll publish these as well as soon as I have enough data. Up until now, I have been focusing on growing my email list – and that will still be a goal going forward. 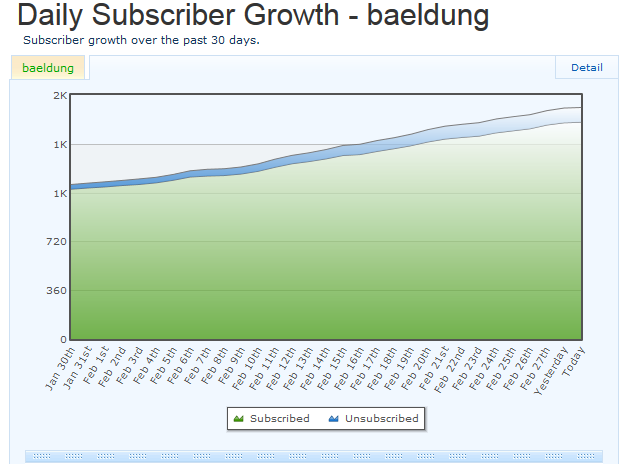 Now – considering that before September 2013 I was getting 3 new subscribers per month, and I am now getting over 500 – it’s still a little surreal. I have learned a ton of stuff in the process about writing copy, conversion optimization and running A/B tests – and I think it’s time to put these lessons to good use with my next project on baeldung: an infoproduct – namely a video course. I will go into full details on the course (or rather courses) in an upcoming post, and of course putting these course out is going to be my next public case-study. I will document the entire process – how I create the sales page, how I drive traffic, how I optimize conversions, how I keep the email list warm, etc – right here. So – in short, I’m going to learn how to launch my first infoproduct here, in the public eye – and share everything I learn along the way. The main takeaway this month is that, even though I am good numbers now, the actual overall conversion from reader of the blog to email subscriber is still low (under 1%) – so there is still a lot of room for improvement. The experiment in early February proves that low hanging fruit still exists, and the second experiment (not yet published) is further proof of that fact. The second big takeaway is that, in order to learn, I need to continue doing new things. It’s one thing to read about writing a sales page and quite another to write one yourself. Launching these infocourses will be a great chance to learn the ropes and go through this start to finish – which is very exciting.